This post is sponsored by Academy Sports + Outdoors®, a premier sports, outdoor and lifestyle retailer of sports and leisure products, footwear, apparel and much more. All thoughts are my own. I have to admit – I never paid much attention to the turkey frying craze. I was pretty happy with my turkey-cooking skills, thank-you-very-much. Plus, I don’t fry much food to begin with, so the idea of frying an entire turkey seemed a little over-the-top. But…I heard that people were getting amazing results with their fried turkeys, so I kept my mind open. So when Academy Sports asked if I’d like to try out a turkey fryer, I was curious. And when I saw The Big Easy oil-less turkey fryer from Char-Broil, I was intrigued, to say the least. A fried turkey with no oil? I’m in! The Big Easy turkey fryer is available online and in store at Academy Sports, and based on my initial experience with it…it’s worth every penny and I would buy it again in a heartbeat! 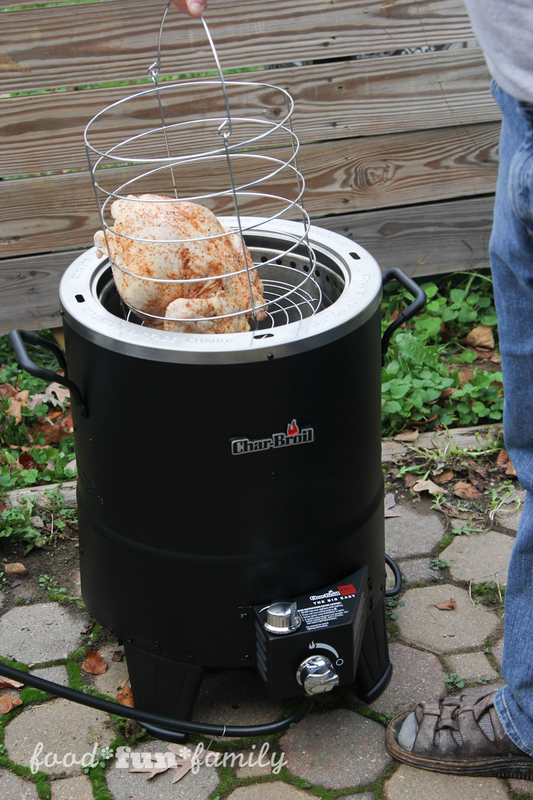 Classic gas fryers: These classic turkey fryers are used outdoors, use oil, and run off propane. 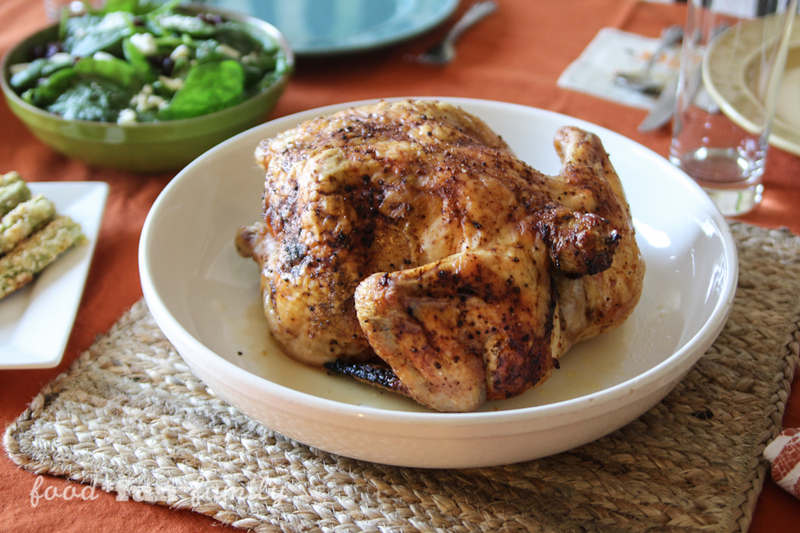 Immersive heat makes a perfectly cooked, flavored bird with crispy skin and juicy meat. Electric fryers: Since electric fryers don’t use propane, they can be used indoors. It’s just the electric version of the classic fryer. With built-in temperature controls – electric fryers fry, steam, boil, roast and more. Oil-free fryers: Without oil, the oil-free fryers technically don’t “fry” turkeys, but they provide a similarly crisp, delicious bird without the oil. They also use propane so must be used outdoors. 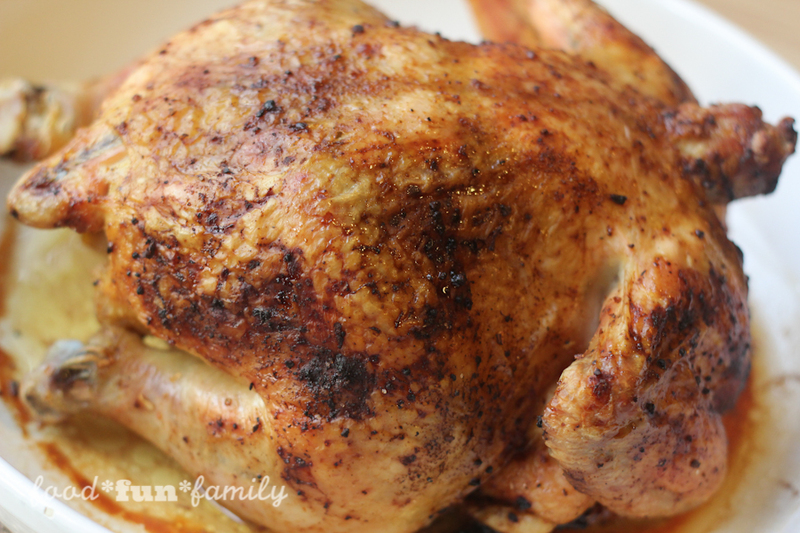 These use radiant heat to offer less mess and a healthier turkey “frying” option. Like I mentioned above, I picked an oil-free turkey fryer, but there are a ton of options for delicious fried turkeys. In general, the following turkey frying tips apply to different types of turkey fryers (except, of course, that tips about the propane tank will not apply to electric turkey fryers). 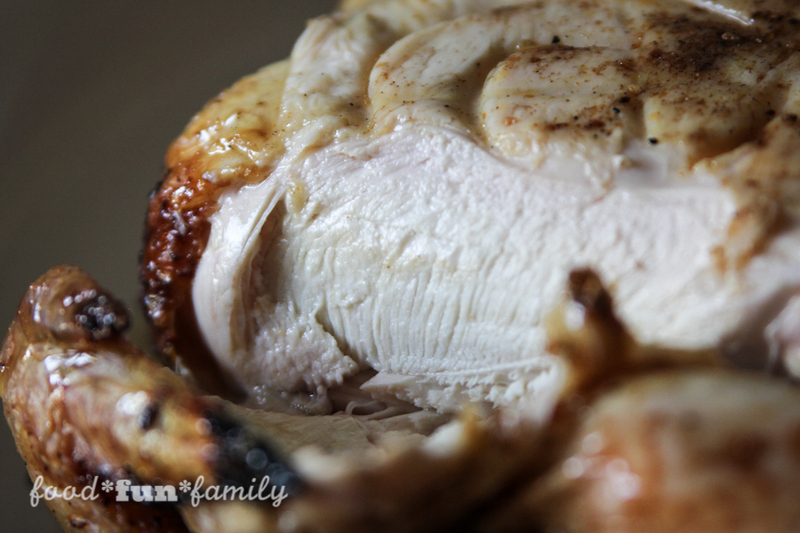 Check this FREE turkey frying eBook for even more tips! Choose a level surface outdoors away from other objects. Keep the propane tank as far away from the fryer as possible without causing a tripping hazard. Prepare your turkey: rinse and then dry thoroughly (pat down with paper towels) and then add spices. Do not stuff your bird. Insert prepared turkey neck down in the turkey frying basket. Figure out frying time: For my oil-less fryer, turkey takes about 10 minutes per pound and chicken takes about 15 minutes per pound. When it’s close to the time for your bird to be done, insert a meat thermometer to ensure that the meat has come to a safe temperature. Turn off the burner before putting the turkey in and taking it out. 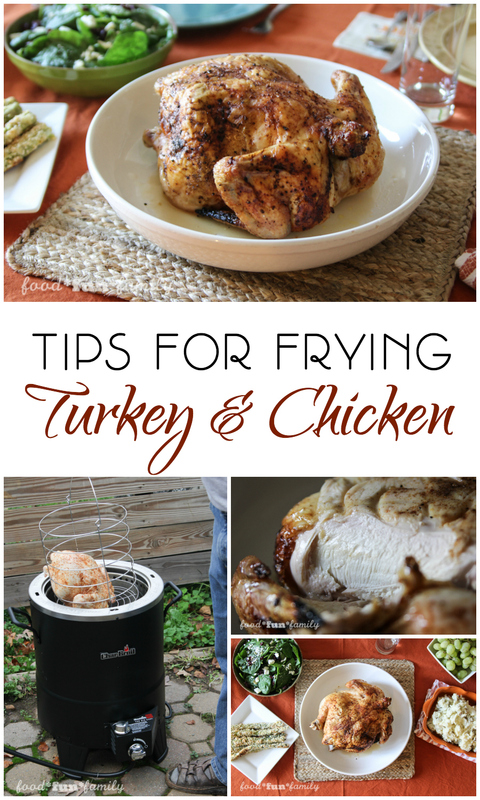 Thank goodness I had the handy turkey fryer guide as a resource! Be sure to download yours before you cook your turkey this season! It’s hard to find a turkey at the end of October. Who knew? 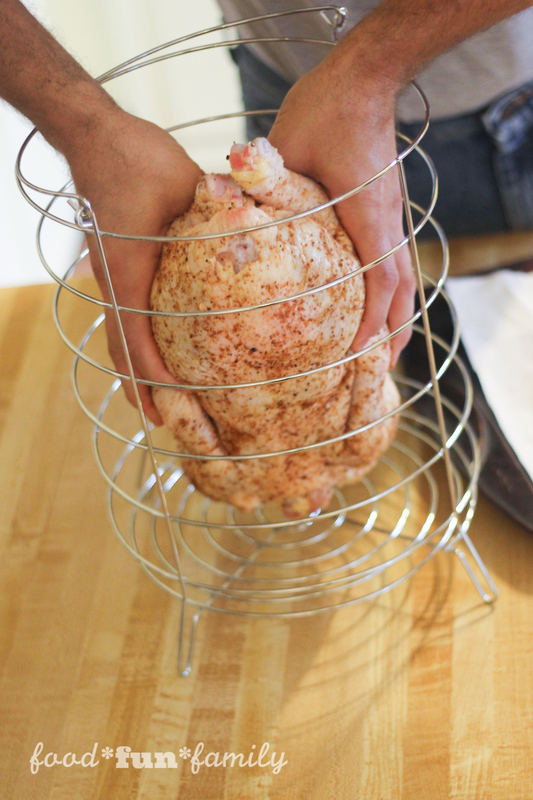 I settled for a seven pound chicken instead to get used to my turkey fryer, which I think was a great choice. 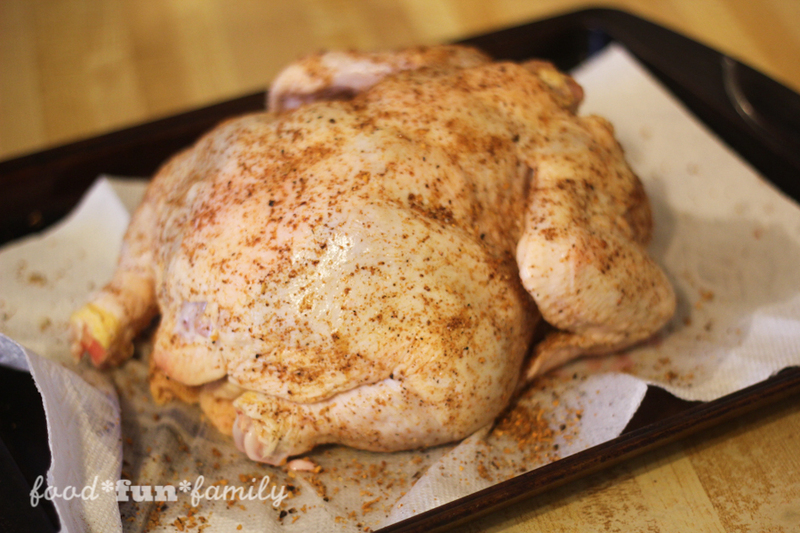 I decided to season my chicken with a simple smokehouse maple seasoning dry rub. All I had to do to prepare my chicken was rinse, dry, and rub it with seasoning. It couldn’t have been easier. And I can tell you that it couldn’t have smelled better than it did while it was cooking! 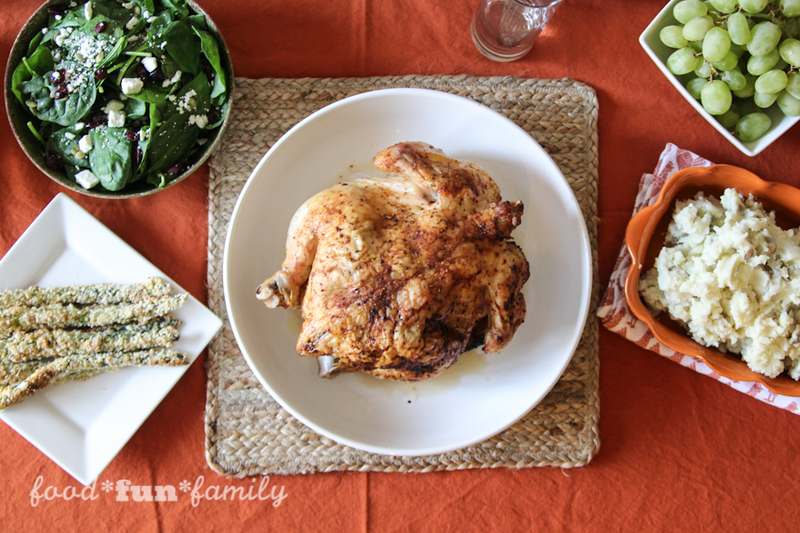 You really don’t have to do much to get a tasty fried turkey. The basket that holds the bird is more appropriately sized for a turkey, and I followed the directions for placing a turkey inside the basket to be cooked (ie, neck down). While the basket CAN hold all different sizes, shapes, and types of meat, I would have been better off placing my chicken breast-side up in the basket to cook. When the neck-down chicken fell over, it fell breast-side down, which is totally fine, except that the beautifully crisp skin ended up on the “bottom” of the chicken. My turkey fryer has a wire mesh lid, but the manual actually recommends not using the lid except on cold (under 40°F) or windy days. Using the lid will actually reflect more heat down onto the top of the bird, resulting in a browner, crispier skin (which is not always a bad thing!). I was worried about leaves or squirrels getting in the fryer while the chicken cooked, so I opted to use the lid. If it were only about the taste, I would still give my first turkey frying (or chicken frying) experience a big thumbs up. It was so much easier than I thought it would be, and the meat could not have turned out better! But I think the best part of having a turkey fryer is the fact that my oven will be free to make pies and rolls on Thanksgiving Day instead of cooking an oven-filling turkey all day long. I am thrilled about the convenience of having a turkey fryer to free up the oven space, but I’m even more excited to have the fried turkey experience without having to use gallons and gallons of oil! This could not have been a better fit for my family. 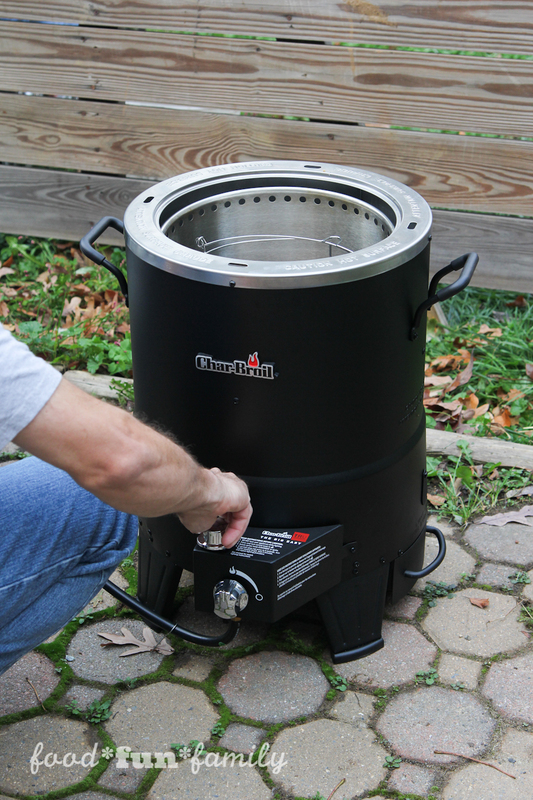 Which turkey fryer would be the best fit for your family? Since I got my Big Easy turkey fryer from Academy Sports + Outdoors®, I’m thrilled to offer a lucky reader the chance to win $100 to spend at Academy Sports (in store or online). ….and I’m sure that you’ll be able to find a ton of things to add to your wish list. May I suggest a turkey fryer? What would you get with a $100 Academy gift card? This giveaway will end on November 16, 2016 at 11:59pm ET, after which one winner will be chosen at random and notified via email. Note: Academy Sports + Outdoors® is not affiliated with the gift card giveaway sweepstakes. Good luck! I like to cook my turkey in the slow cooker. It comes out very tender. I like to bake my turkey in the bag it’s nice and juicy and easy clean up. I like to cook my turkey with lots of spices to make it flavorful. Commented on Creamy Chicken Poblano Soup. I like to roast my turkey in an oven bag. Easy cleanup! I guess I’m a traditionalist–I roast my turkey in the oven. I don’t have any great tips to share, except that it’s very simple to thaw a frozen turkey using cold water. Change the water frequently, keep the turkey submerged, and it will be thawed in a matter of hours. I’ve done the same thing for years! I swear by those oven bags. THey’re fool proof! The one benefit to the turkey fryer, though, is that I can use my oven for making all my pies and rolls. I like roasting mine in the oven with lots of butter. I use a technique where you keep the oven closed the whole time the turkey cooks. It really works! We love to brine the turkey before we go it and then we roast it the oven. I just like to bake turkey in the oven, but last year we had a smoked turkey! Other family members always make the turkey for Thanksgiving, I’m famous for my pecan pies. I do make turkey breast at home and I usually make it in a crock pot with an envelope of french onion soup mix on top and rubbed under the skin. I love to roast it and slow cook and never overcook it! I love to slow roast a turkey and baste it regularly to maintain the moisture! Best holidays are spent with family so make sure to be surrounded by them. I don’t do anything special to cook the turkey. I usually just roast our turkey and use a marinade. I do not cook a whole turkey. I cook two turkey breasts and I cook them in a Reynolds cooking bag. They come out juicy and delicious and there is no big messes with the turkey bag. It holds all the drippings. I like to make sure the turkey is well done but still moist. I season it well and cook with carrots, potatoes and onions. Turkey in the bag, easy! I have no tips, you do not want my advice on cooking. We usually just bake the our turkey but I would love to try this instead. Thank you! We usually brine it first than bake it. However this year we’re going to cook it on a smoker grill. First time and we’ll see how it comes out.